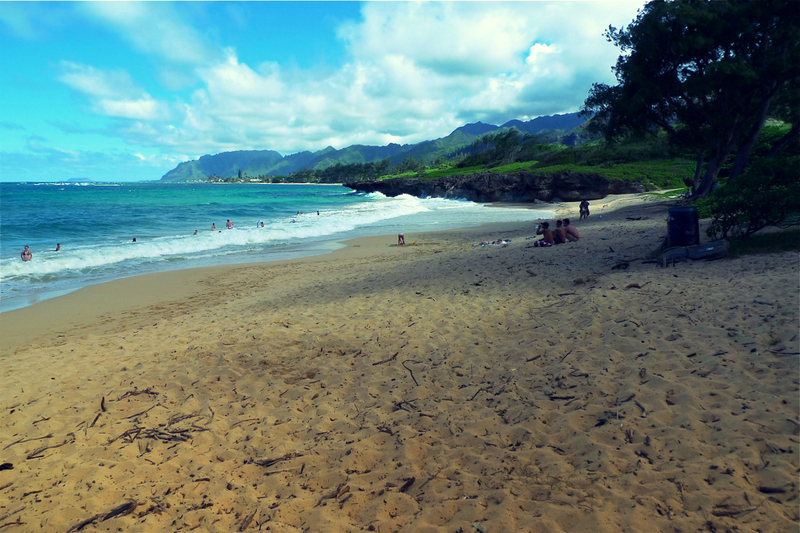 This past summer, Joshua spent two months in Kauai interning with the Koke‘e Resource Conservation Program (KRCP). There, he learned about and participated in the protection of our native ecosystems. He said it was a summer he’ll remember for the rest of his life. 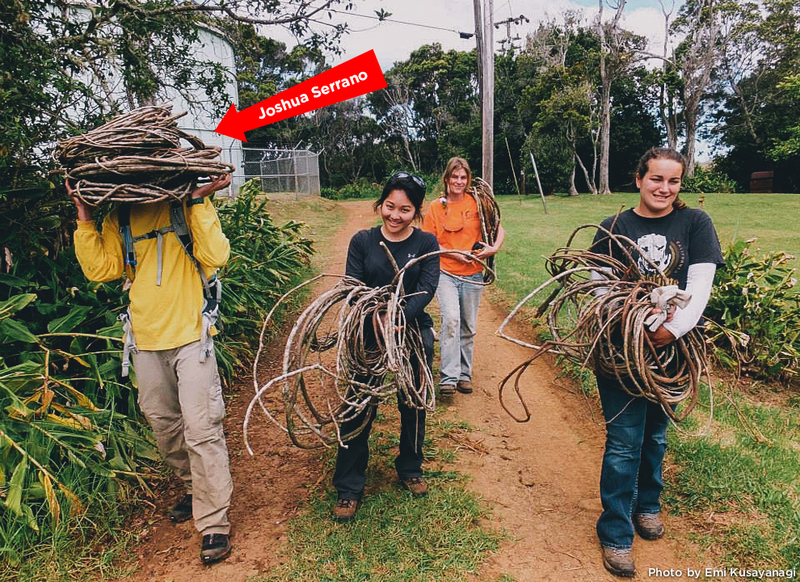 Please enjoy this story about the importance of conservation in Hawaii and Josh’s experience with the KRCP. The most isolated chain of islands found on Earth. Many flora and fauna arrived to these islands naturally by wind, water, or wings long before humans set foot on these islands. When these plants and animals first arrived they exploited these newly emerged islands and seemingly barren landscapes and over time evolved into the species we find today. 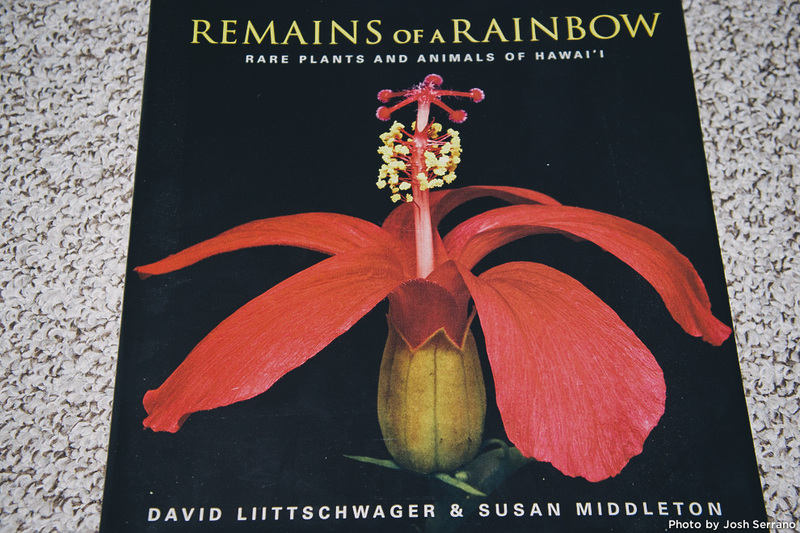 The majority of these species are endemic, meaning they are found only in Hawai‘i and nowhere else in the world. 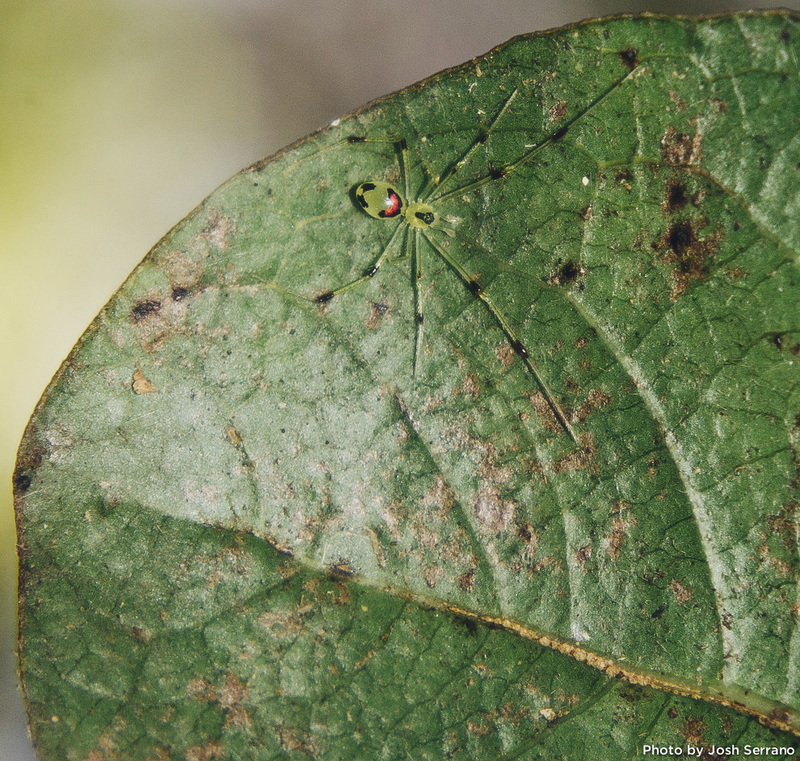 The Nananana Makakiʻi or “Happy Face Spider” (Theridion grallator), pictured above, is endemic to Hawai‘i. 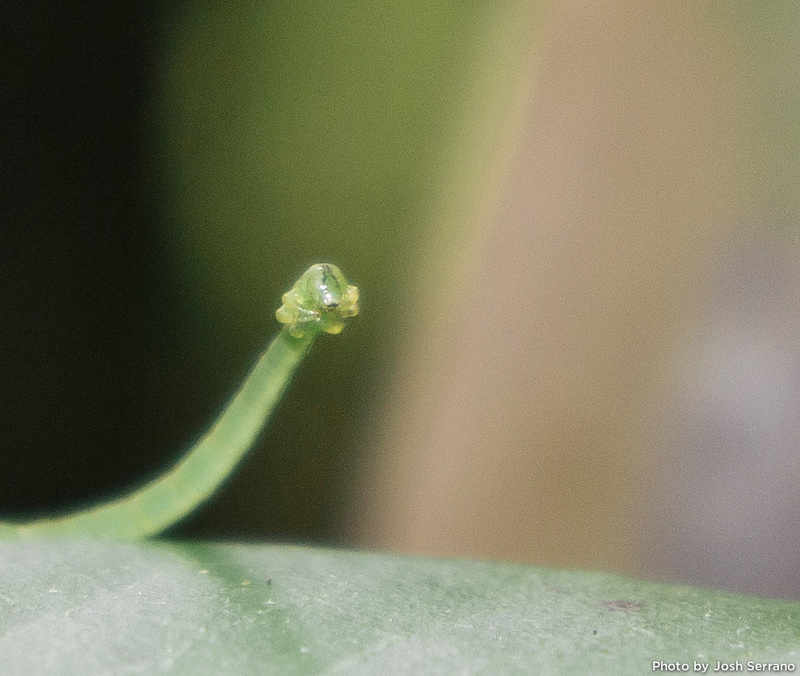 Hawaii also has its own carnivorous caterpillar (Eupithecia spp.). Yes, you read that correctly (watch video). Pictured above is Pōpolo ‘aiakeakua (Solanum sandwicense). 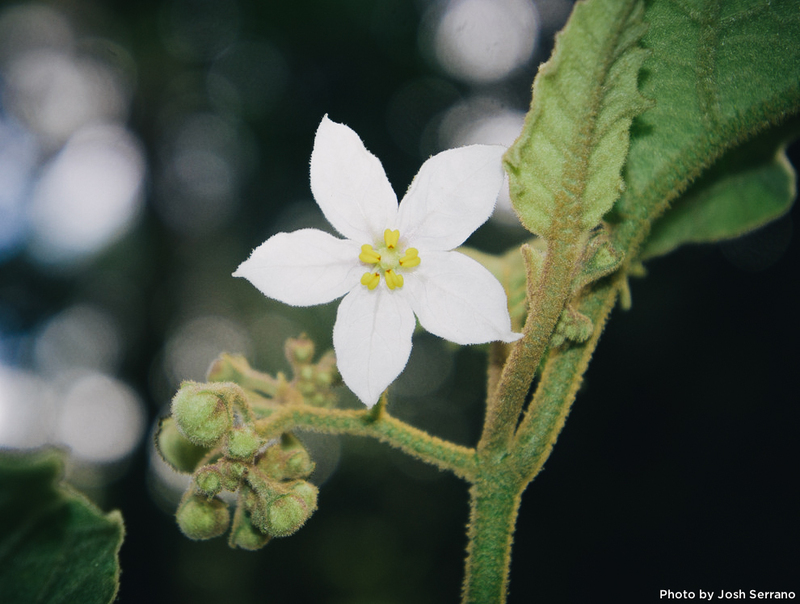 Its name literally translates “nightshade eaten by the gods.” This plant used to be commonly found in the understory on the islands of Kaua‘i and O‘ahu, but now it’s so rare it has been listed on the Federal Endangered Species List. 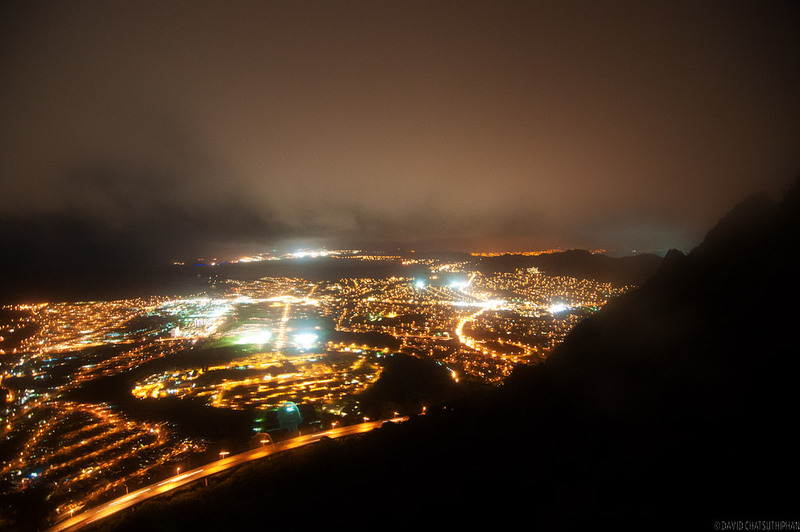 Many native birds, plants, insects, and even land snails have also gone extinct in Hawai‘i. These species may have gone extinct due to multiple factors (invasive species, competition, habitat loss, disease, climate change, etc.). For the remaining native species we find today, many of them need our help or they too may disappear forever and exist only as pictures we see in a book. 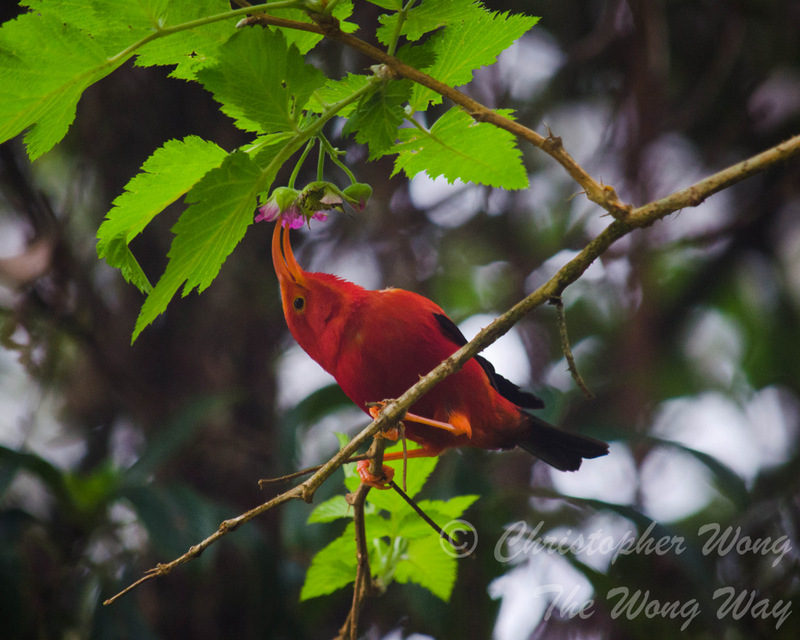 Pictured above is one of our endemic honeycreepers, the ‘I‘iwi (Vestiaria coccinea). The ‘I‘iwi is not endangered, but its populations are declining rapidly due to reasons like habitat loss, diseases like avian malaria, etc. Our Hawaiian honeycreepers represented one of the most incredible displays of adaptive radiation, where a single common ancestor becomes many new species over time. Hawai‘i had at least 54 honeycreepers that all evolved from a common ancestor, but only 18 of them remain. Most of them are either endangered or threatened. 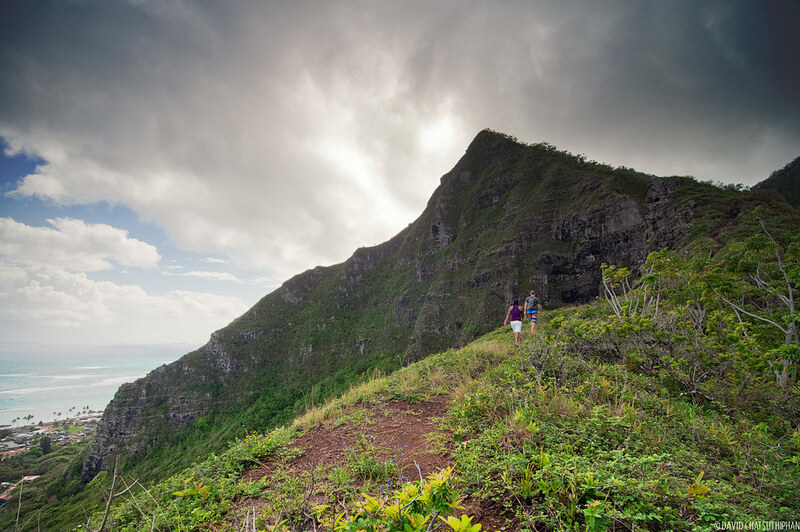 In Hawai‘i we have these lush green mountains. But is green good enough? 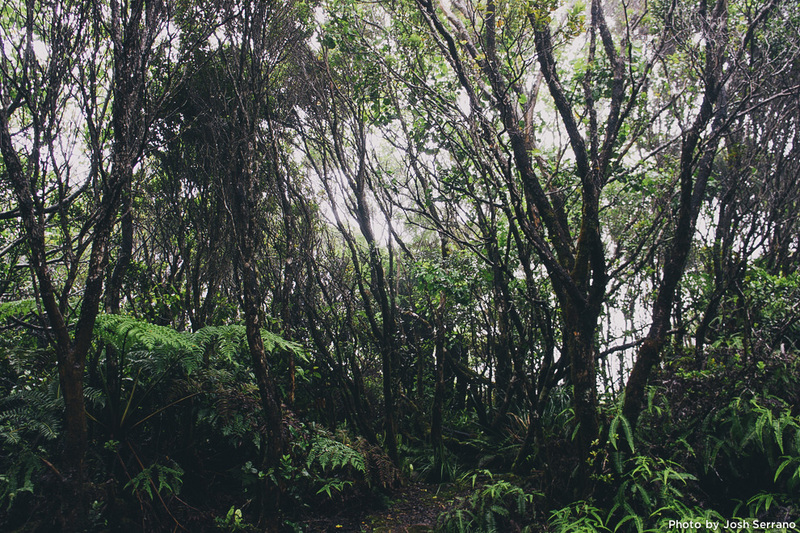 In Hawai‘i, our native forests tend to be diverse with many layers, whereas a forest with heavy presence of invasive species tends to be monotypic (meaning, they only contain one species). 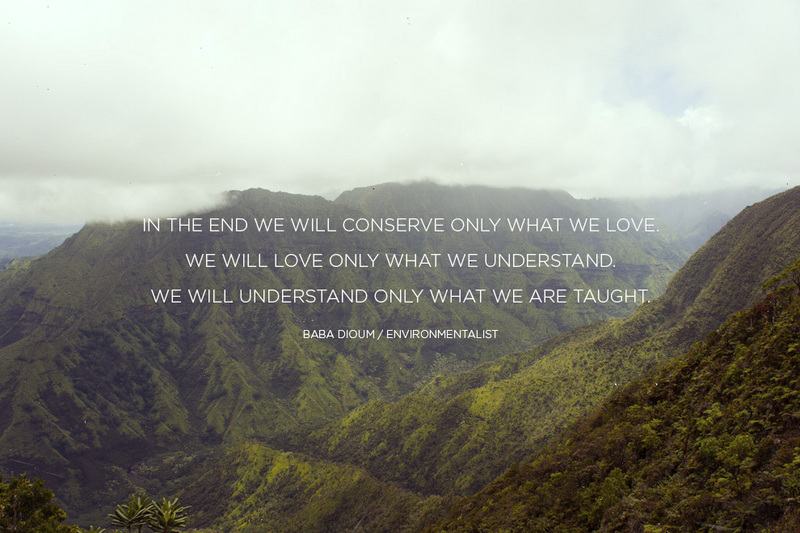 Native forests provide erosion control, habitat for native species, cultural resources, clean air, and water. Our native forests not only store our water that eventually percolates down into our aquifer (where our drinking water comes from), but they are also able catch water from passing clouds. 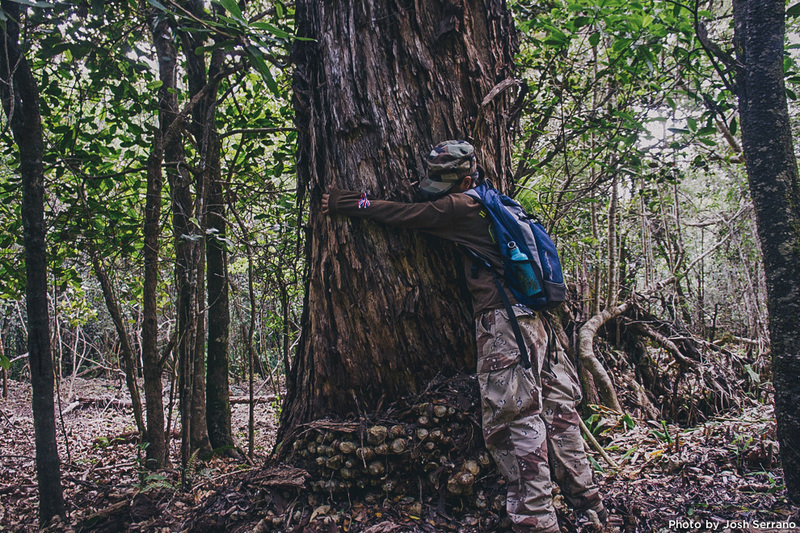 Sadly, native forests are slowly disappearing. Editor’s note: The elusive face of your story author, Joshua Serrano, appears in the top/right of this photo. 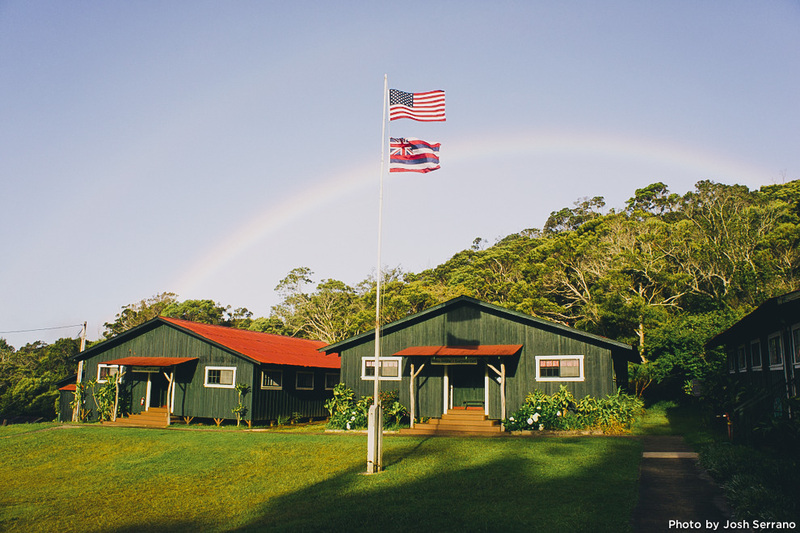 This past summer I was blessed to receive an opportunity to be a summer intern for the Koke‘e Resource Conservation Program (KRCP) on the island of Kaua‘i. 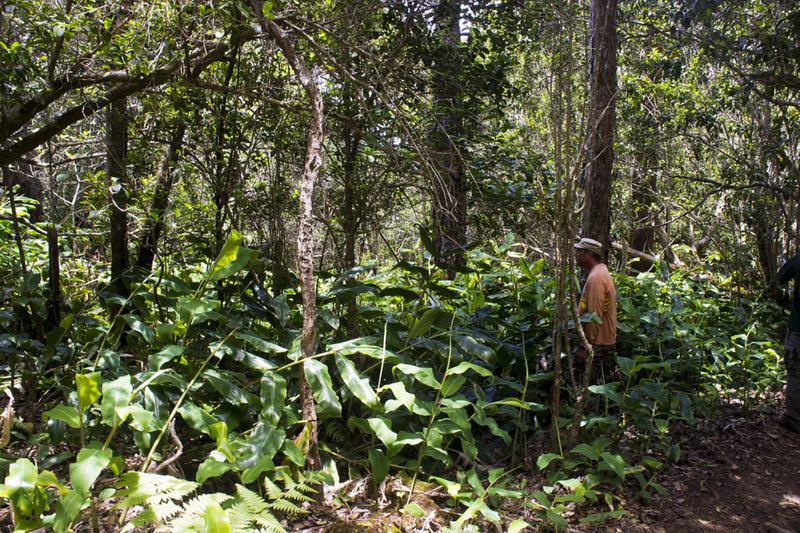 The Koke‘e Resource Conservation Program (KRCP) is a collaborative project in vegetation management of the Koke‘e Region, sponsored by the non-profit Garden Island Resource Conservation & Development, Inc. in cooperation with DLNR’s Division of State Parks and Division of Forestry and Wildlife. 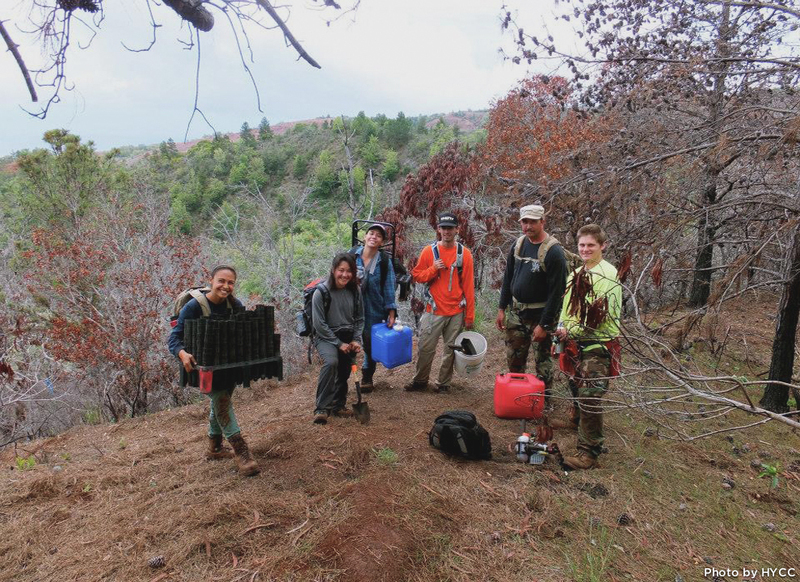 KRCP involves the public in protecting native ecosystem resources, coordinating volunteers to conduct essential invasive alien species removal in selected areas. 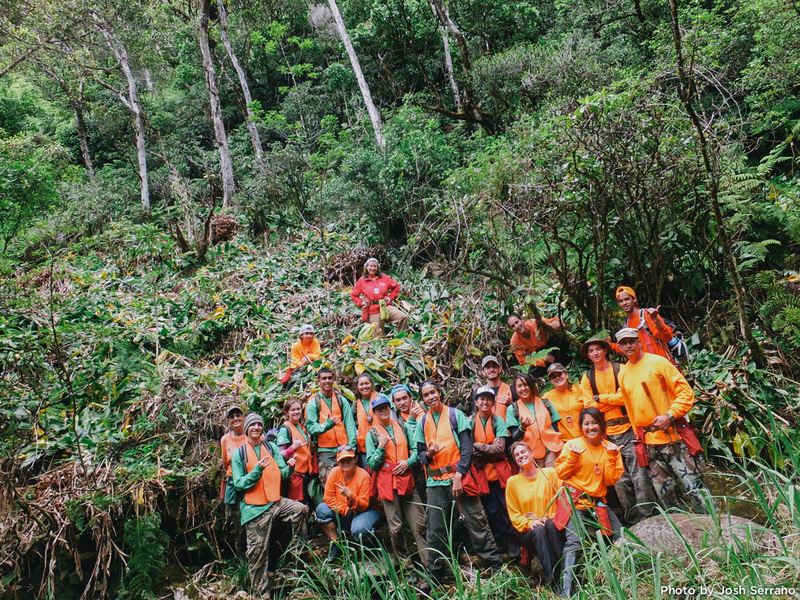 KRCP’s use of volunteers gets a larger job done as well as heightens public awareness of the need for partnerships and community-based management of the unique ecosystems of Koke`e and the Alaka`i wilderness preserve. Their baseyard is located at an historical Civilian Conservation Corps (CCC) camp which would ultimately become my home for the next 2 months along with the rest of the summer interns and volunteers that came through. Shown above are strawberry guava (left) and himalayan ginger (right). 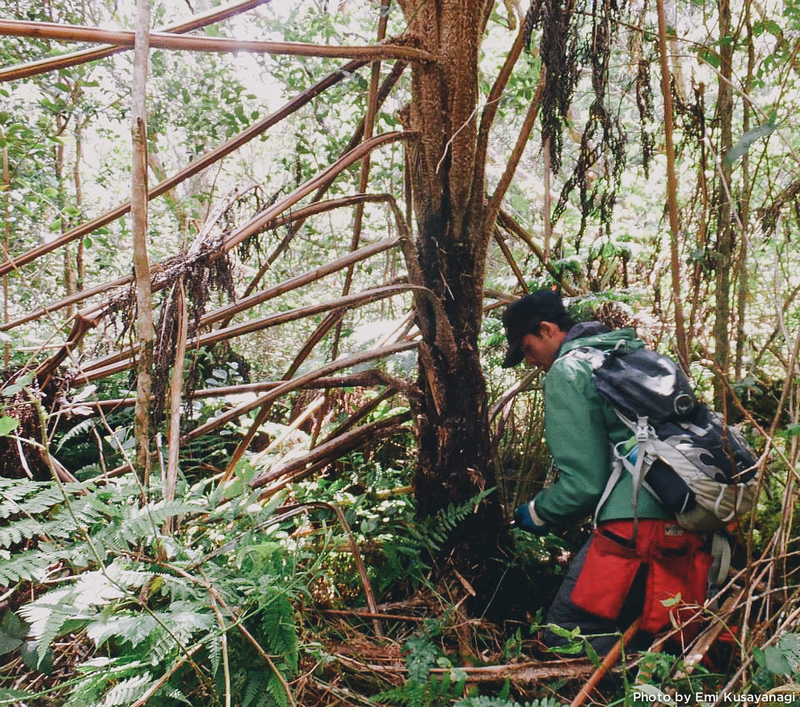 The Koke‘e Resource Conservation Program does primarily alien species control work in the forests throughout the parks. 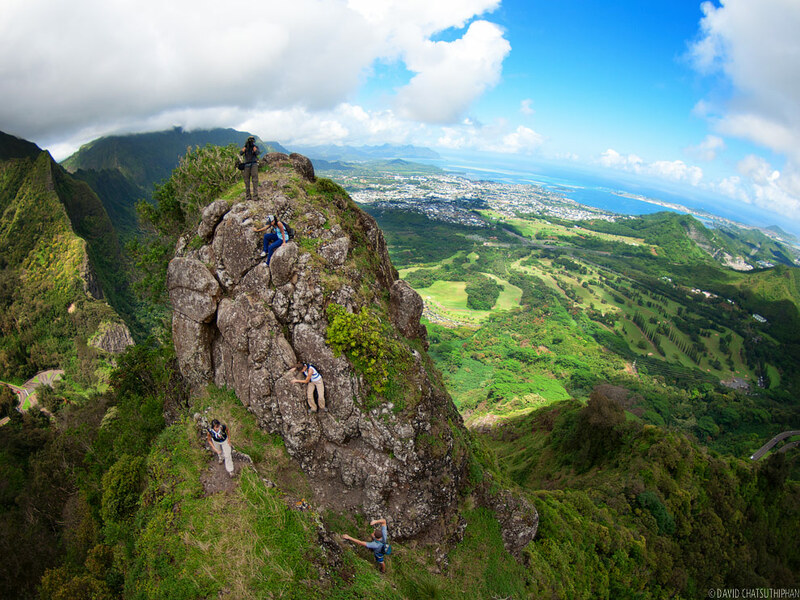 This involves strenuous hiking and the use of herbicides. 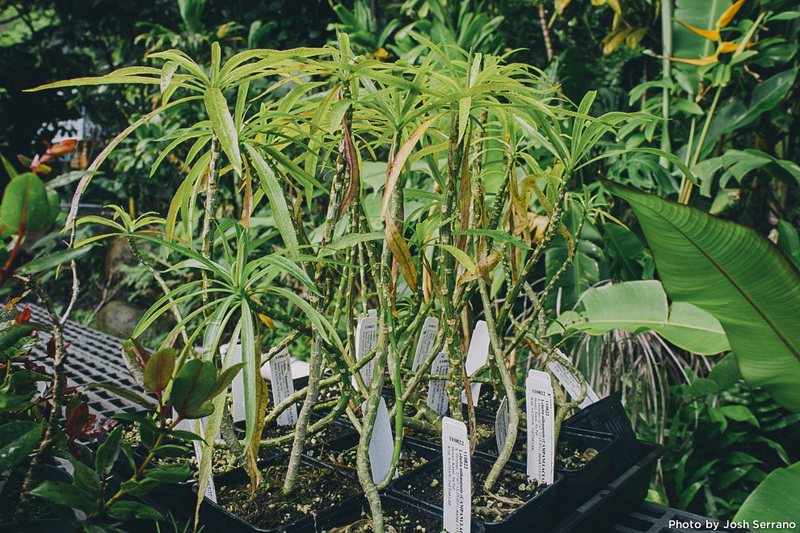 Invasive species are alien species which have been brought to Hawai‘i by humans and are a major threat to our native forests. Not all plants brought by humans are invasive. 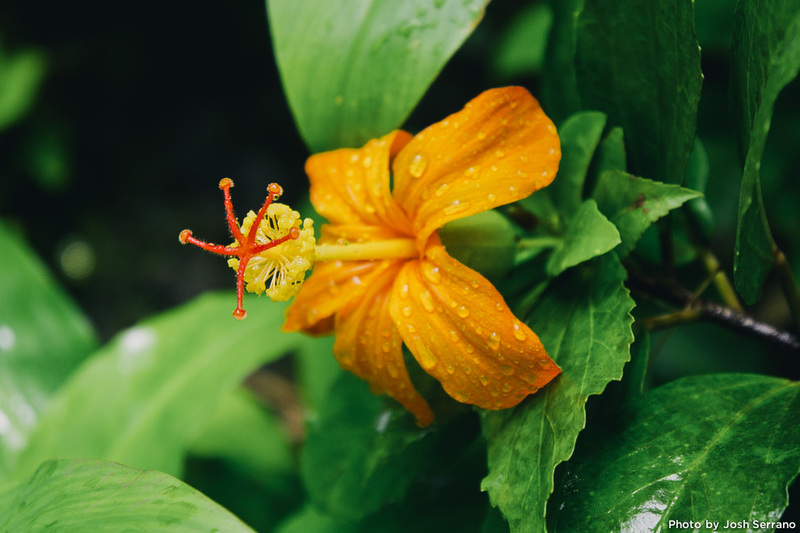 The invasive plants are the ones that tend to grow fast, mature fast, and produce many seeds which allow them to invade native forests over a short period of time. Although we did work on other invasive plants two of our main targets we worked on were strawberry guava or Psidium cattleianum (above, left) and Himalayan ginger or Hedychium gardnerianum (above, right). 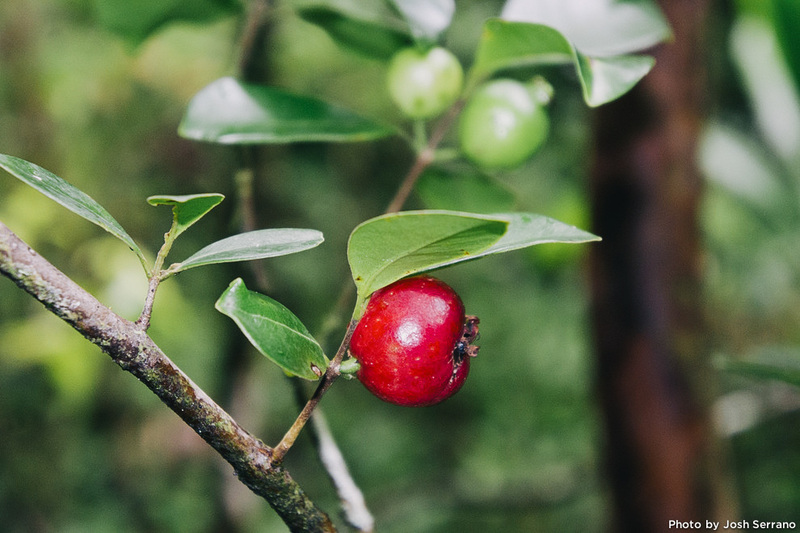 Strawberry guava (pictured above) in particular is probably one of the worst because it is allelopathic, meaning it produces chemicals that doesn’t allow other seeds to germinate or other plants to grow around it. Next time you hike and see a dense thicket of only strawberry guava, now you’ll know why. They are also water hogs, “native forests invaded by strawberry guava lose 27% more water to the atmosphere than pristine forests” – Tom Giambelluca. BEFORE: Most of our days during the KRCP internship would start off with us hiking out to the work-site and finding an area like the one shown above. The canopy is completely native but the understory is loaded with Himalayan ginger which is not allowing any natives to grow. Himalayan ginger can spread without even using seeds. It can reproduce vegetatively via rhizomes (which are thick roots that are storage organs for nutrients and water). But it can also spread using seeds. One flower stalk on average can produce 250 seeds. AFTER: By the end of the day our work-site would look like this. This native ‘ōhi‘a (Metrosideros spp.) tree is happy that it finally has some room to breathe. It also got a free hug. We usually didn’t work on the weekends during the internship, but one weekend we attended the Banana Polka Roundup to do a little outreach. 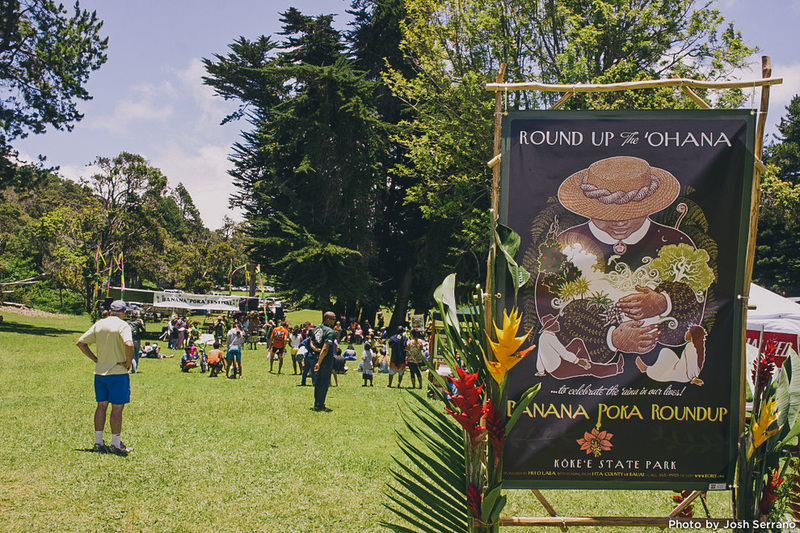 It’s held every year by Hui o Laka at the Kanaloahuluhulu meadow up at Koke‘e. 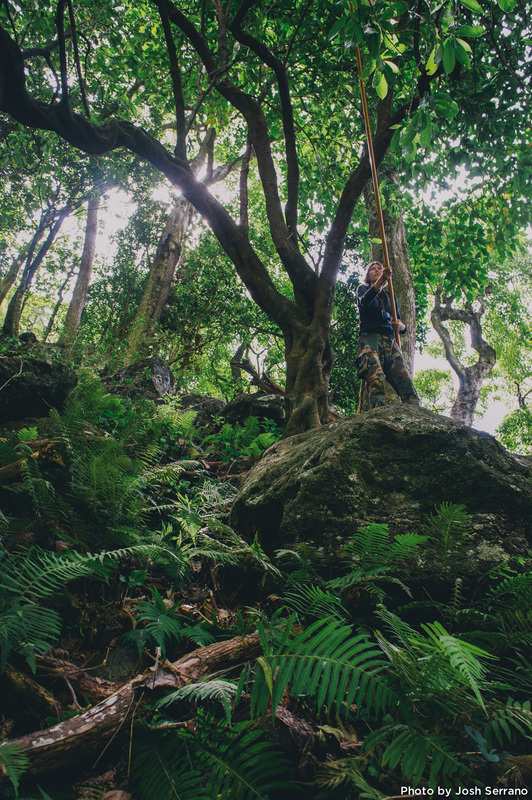 Many agencies were there to raise awareness to the public about Hawai’i’s forests and native species and to inform them of what they could do to help. The day before the Banana Polka Roundup was probably one of my most favorite days. The interns went out to collect some banana polka vines which is another invasive plant found in our forests. These vines would be used the next day to make some cool baskets at the festival. 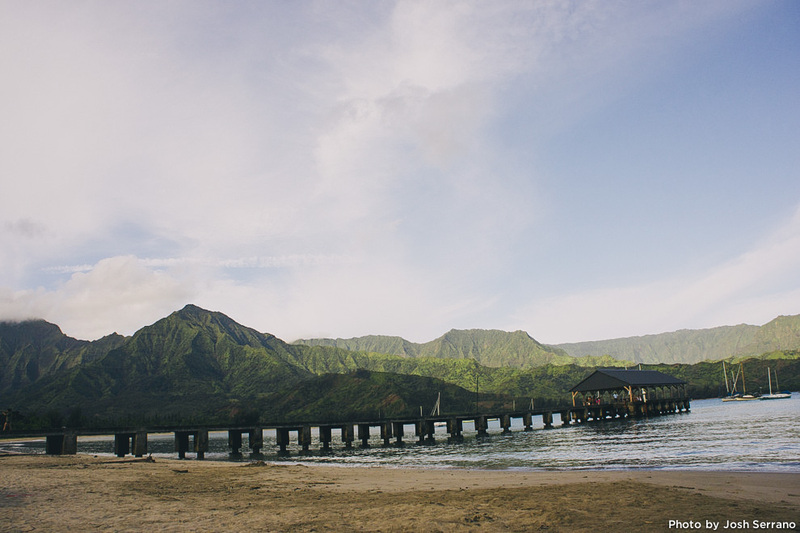 Into Kalalau! 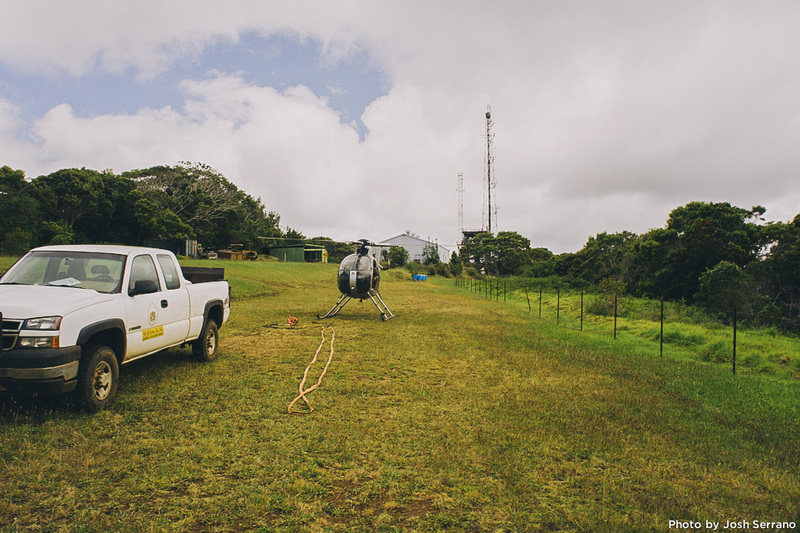 We spent 4 days controlling invasive plants in the valley. 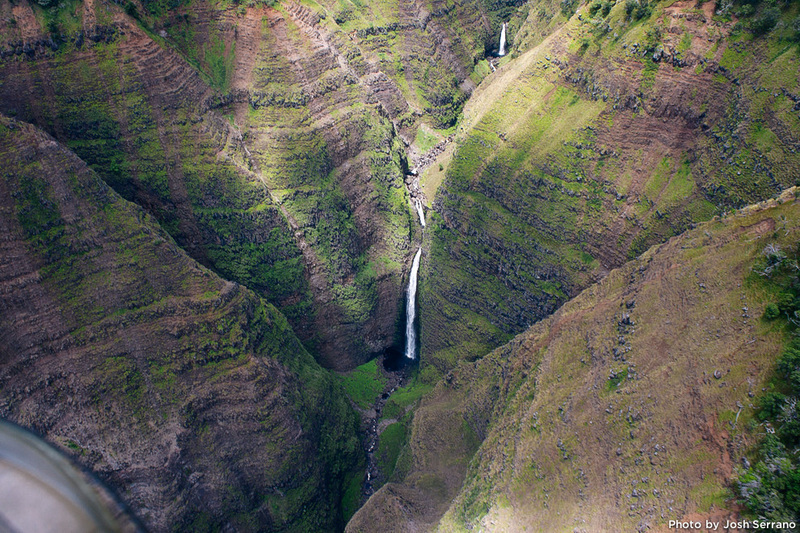 For another work trip we got to fly over Waimea Canyon where we spent 6 days away from civilization. One of those days we worked in a fenced enclosure where this Diellia mannii fern is located. 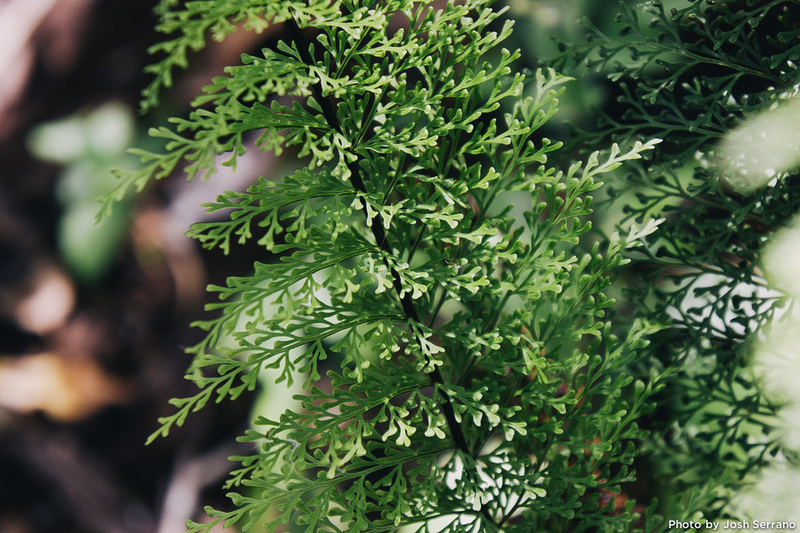 The Diellia mannii fern is an endangered species in Hawai‘i. Many people see fences in the mountains as an eye-sore, but honestly they are the most effective way of keeping ungulates (hoofed animals) out and in turn preserving our precious resources. 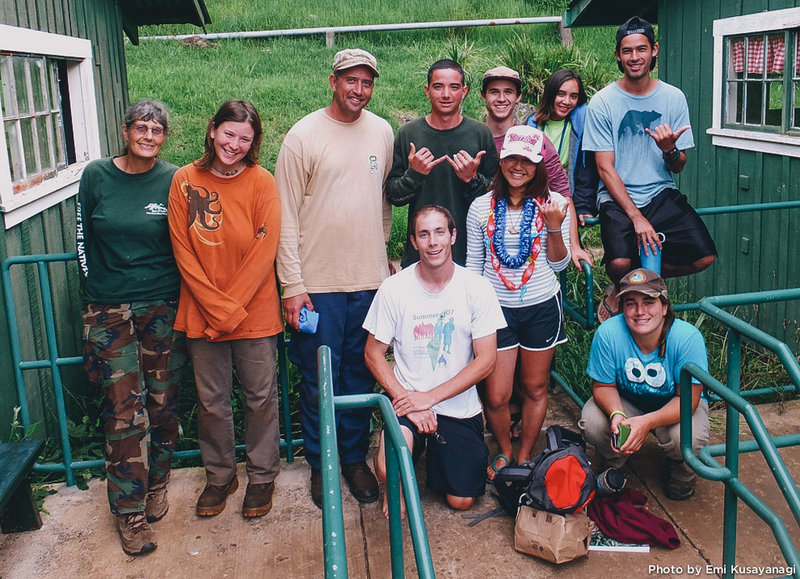 One of the weeks we got to work with the kids from the Hawai‘i Youth Conservation Corps (HYCC). It was great to work with this group and more importantly I’m glad to see some of the up and coming generations taking some pride in their ‘āina (land) and giving back. The majority of our internship workdays consisted of weed control but we did get to outplant some native species a few of the days with the Natural Area Reserves System (NARS) crew. 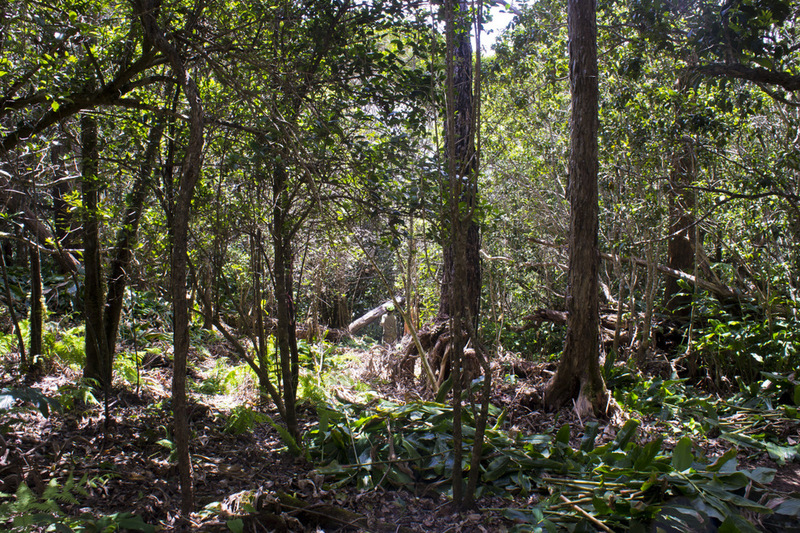 With weeding and outplanting you allow the native species to re-establish within a degraded area in hopes that the forested area will return to a more natural or healthier state. 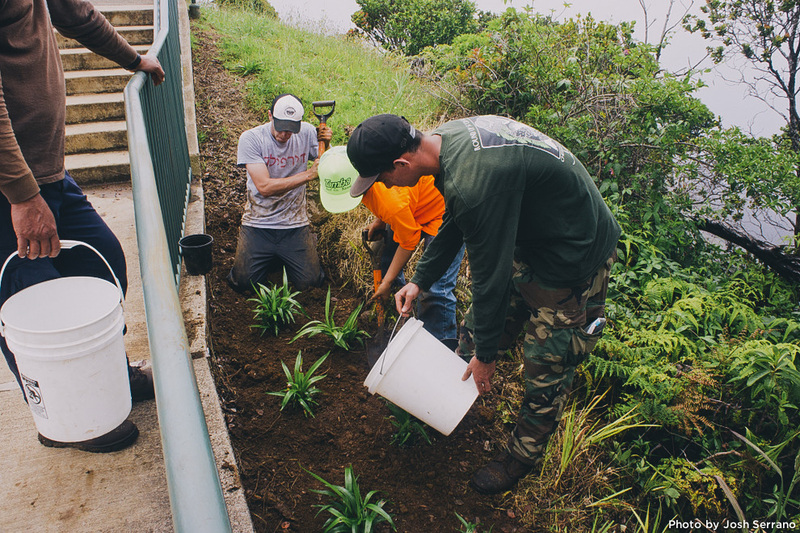 We also got to outplant some native ‘uki‘uki (Dianella sandwicensis) at the famous Kalalau Lookout. We even made a trip out to Limahuli (National Tropical Botanical Garden). 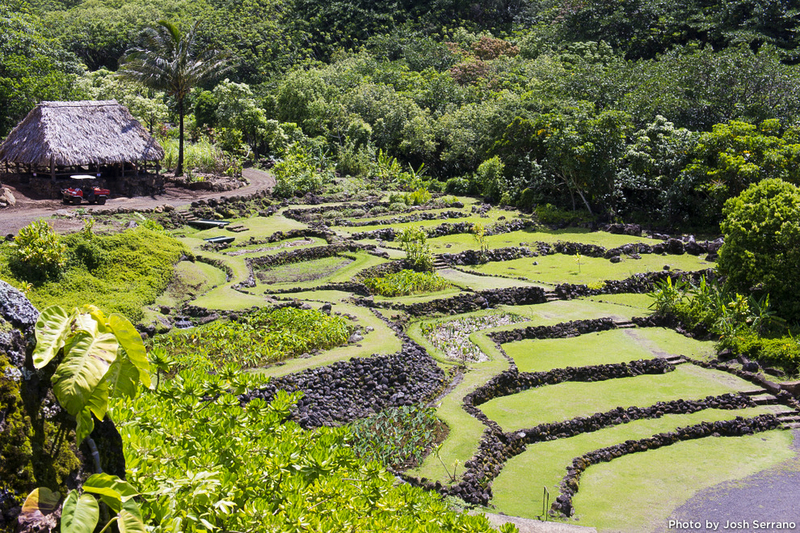 At Limahuli we outplanted some natives and also do a little weeding. I chose the Lobelia niihauensis just because I have a special place in my heart for our native lobeliads. We also got to take a tour to see some of the amazing native plants they have. This one is endangered and endemic not just to Hawai‘i, but it can only be found on the island of Kauai. Its the flower of Koki‘o ‘ula‘ula (Hibiscus kokio ssp. saintjohnianus). 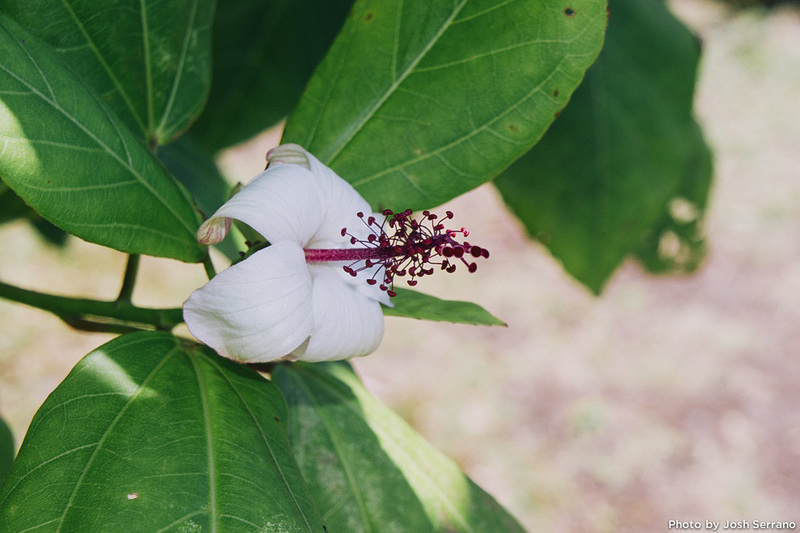 The Koki‘o ke‘o ke‘o (Hibiscus waimeae ssp. hannerae) pictured is also endangered an only found on Kaua’i. We basically went hiking around to find rare plants to collect fruits, if they had any. 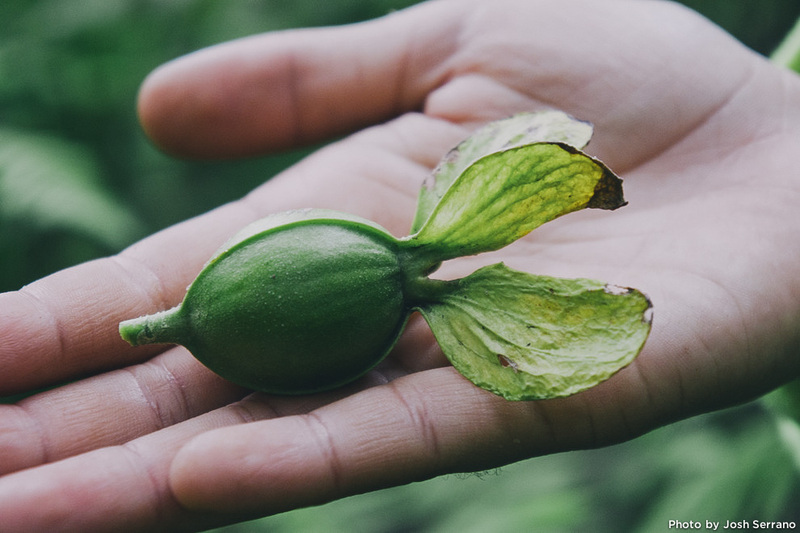 These immature fruits would be sent to the Lyon Arboretum Micropropagation and Storage Facility in hopes to produce more plants of these endangered species. 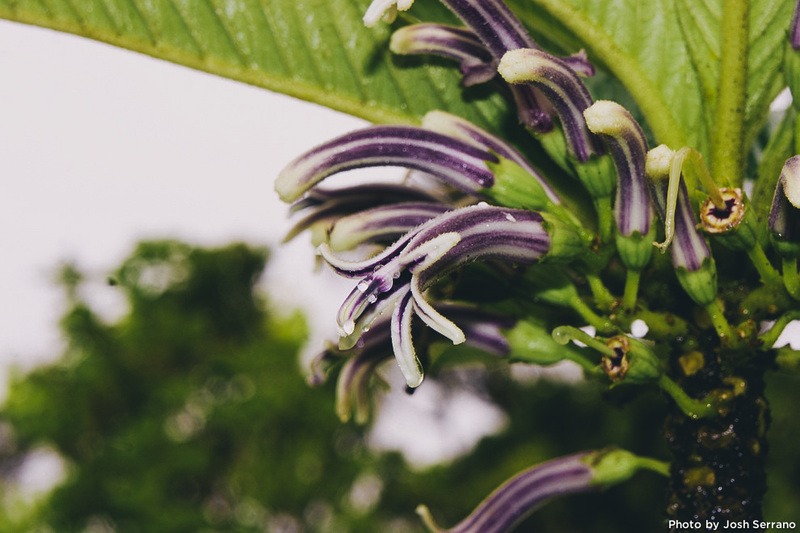 Above is the flower and fruit of the Nānū (Gardenia remyi). 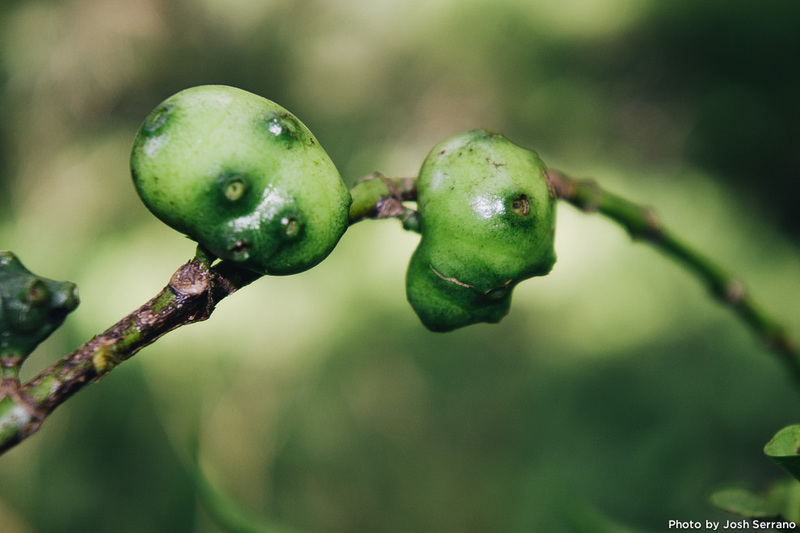 These are Noni Kuahiwi (Morinda trimera) which is the only tree of its species found on the island of Kaua‘i. One of the great things about the KRCP internship was the variety of work-sites and we got to see and all the different experiences they lead us on. 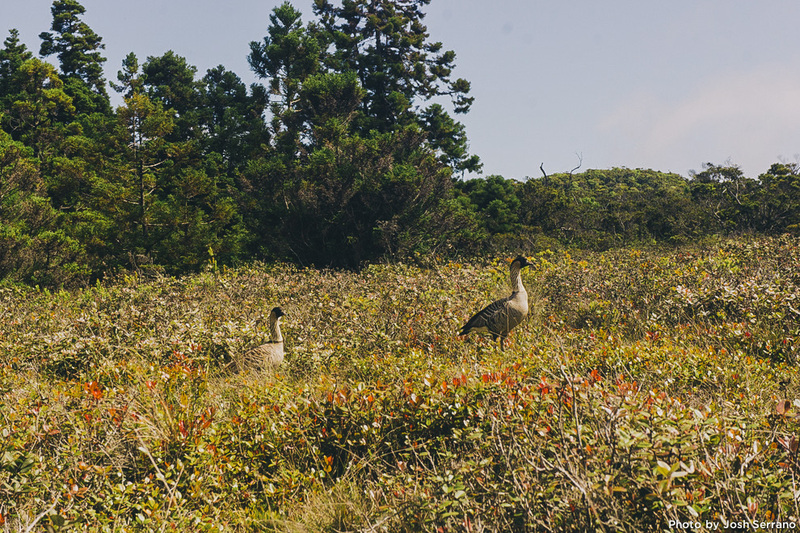 Like on the Alaka‘i Swamp Trail where we go to see some endangered Nēnē (Branta sandvicensis). If you’re a plant-nerd like myself, you’ll be happy to find some amazing plants like this Hāhā (Cyanea hirtella) on the Alakai Swamp Trail. I get beyond stoked whenever I see an endemic plant that is actually flowering. 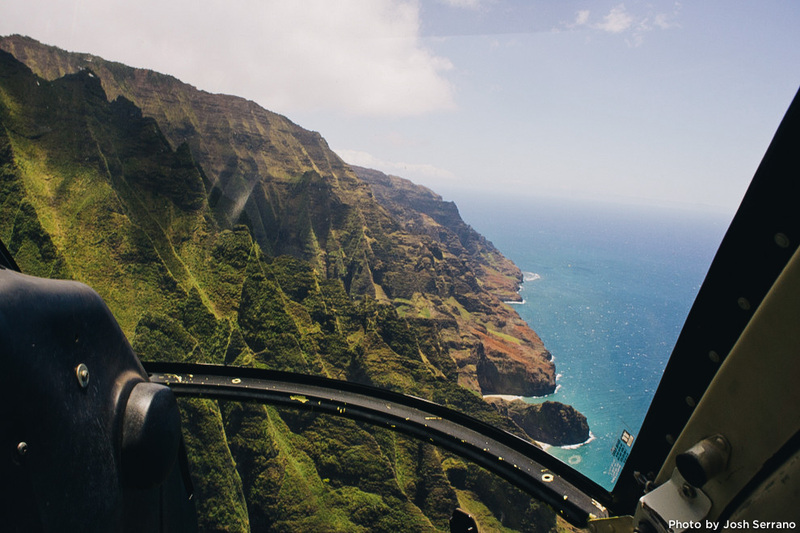 In Hawai‘i 90% of the flowering plants are endemic to these islands. This percentage is higher than any other place in the world. 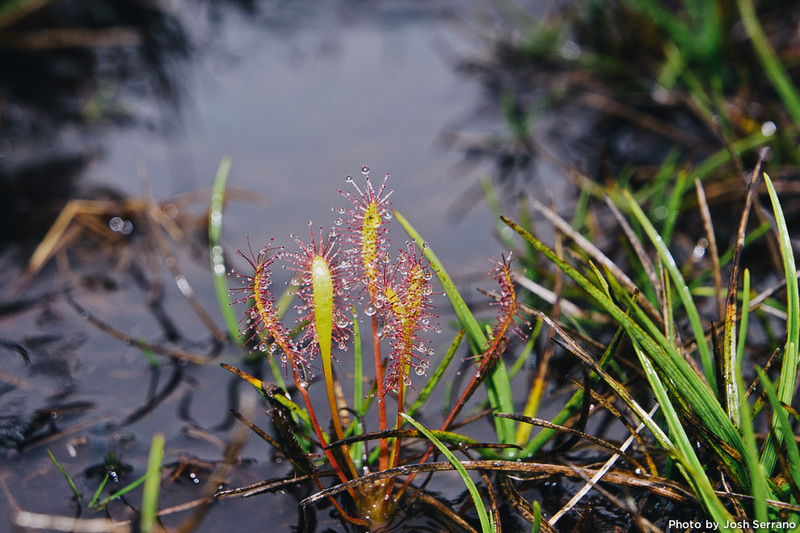 Mikinalo (Drosera anglica) is another one of those interesting plants which is found in the low-nutrient bogs on Kauai’s Alakai Swamp Trail. It also happens to be Hawai’i’s only native carnivorous plant (video). 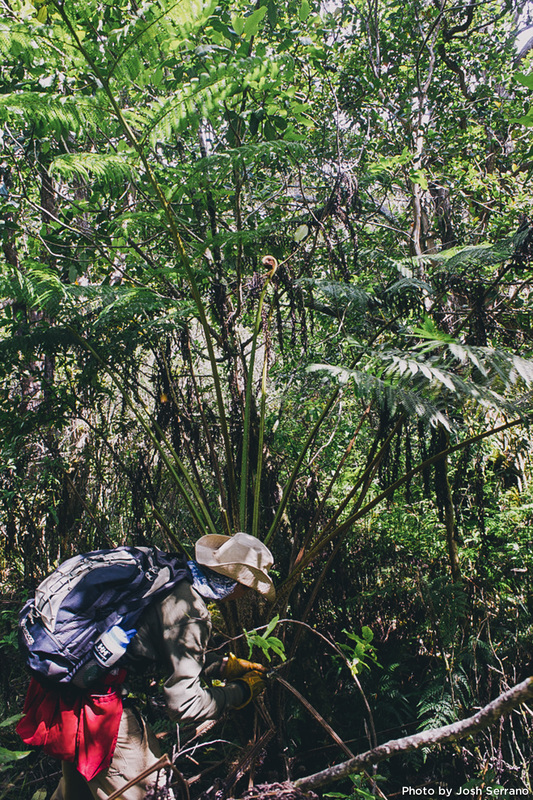 In the Alaka’i Wilderness Preserve we went after other invasive plants like this Australian tree fern (Cyathea cooperi) which possess white scales on its trunk. They can grow to be very tall and shade out native species. 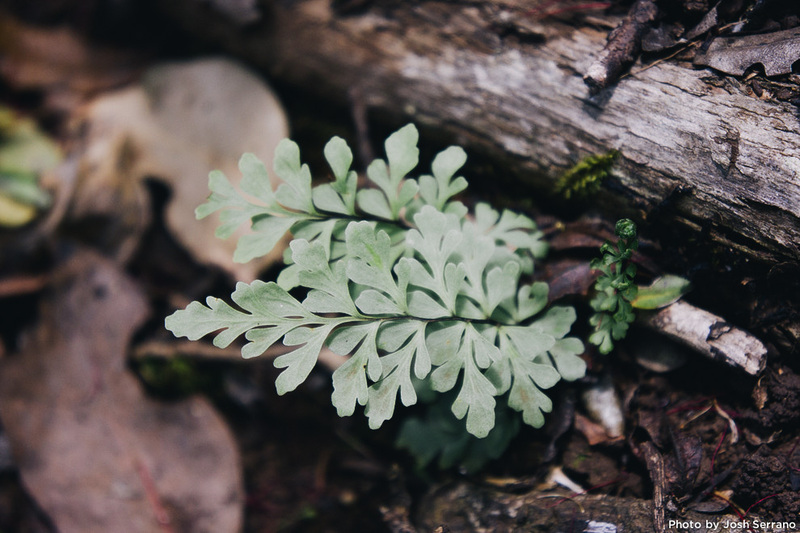 Since they are ferns they reproduce asexually by producing thousands of wind-borne spores when they are mature. KRCP consists of a small staff and they rely on volunteers. Volunteers are needed year-round. There are many organizations out there that are always looking for help. Check out www.preservehawaii.org/volunteer/ for a nice comprehensive list of organizations throughout the islands that have volunteer opportunities. First and foremost I want to thank KRPC for giving me the opportunity to work for them over this past summer. They have helped open doors for me to help create a better future for myself and I’m forever grateful. I also want to thank Emi Kusayanagi and Christopher Wong for providing some of the photos for this post. – Text and images provided by Joshua Serrano.